"He had never had any money for sweets with the Dursleys and now that he had pockets rattling with gold and silver he was ready to buy as many Mars Bars as he could carry- but the woman didn't have Mars Bars. What she did have were Bertie Bott's Every-Flavour Beans, Drooble's Best Blowing Gum, Chocolate Frogs, Pumpkin Pasties, Cauldron Cakes, Liquorice Wands and a number of other strange things Harry had never seen in his life. Not wanting to miss anything, he got some of everything and paid the woman eleven silver Sickles and seven bronze Knuts." I can just imagine wee 11-year-old Harry's heart dropping for a moment when he saw there were no Mar Bars, something he must've have dreamed of being allowed to buy himself for years, but soon forgetting all about them when he saw the magical treats in front of him. And then sharing everything with Ron and being pleased just to have someone to share, which is the sweetest thing ever. "Harry's mouth fell open. The dishes in front of him were now piled with food. He had never seen so many things he liked to eat on one table: roast beef, roast chicken, pork chops and lamb chops, sausages, bacon and steak, boiled potatoes, roast potatoes, chips, Yorkshire pudding, peas, carrots, gravy, ketchup and, for some strange reason, mint humbugs. The Dursleys had never exactly starved Harry, but he'd never been allowed to eat as much as he liked. 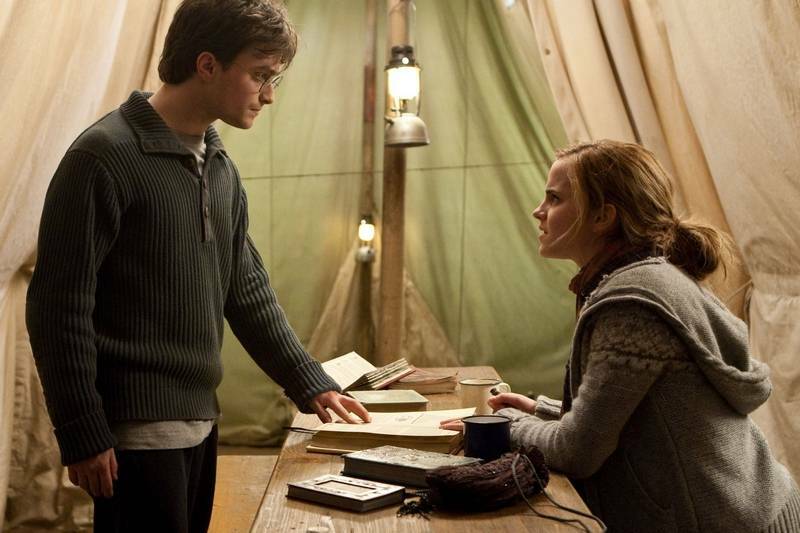 Dudley had always taken anything that Harry really wanted, even if it made him sick. Harry piled his plate with a bit of everything except the humbugs and began to eat. It was all delicious." 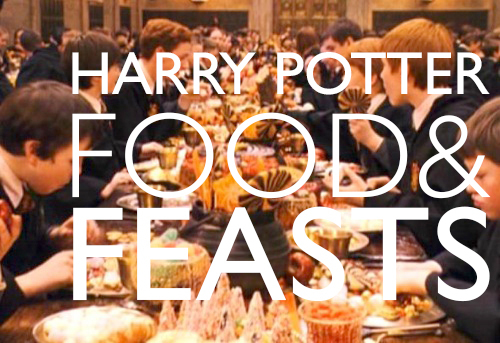 I'm sure feasts and banquets at Hogwarts must eventually become a bit old hat, but this first feast, seeing so much delicious food appear right before his eyes must've made Harry suddenly feel the luckiest boy alive. The decadence of every kind of meat piled in front of him, deciding to try a bit of everything, realising he wouldn't have to give any to Dudley; the perfect magical moment, second only to the array of deserts that would appear right after. It was dinner time. Harry had just finished telling Ron what had happened when he'd left the grounds with Professor McGonagall. Ron had a piece of steak-and-kidney pie halfway to his mouth, but he'd forgotten all about it. '-a century,' said Harry, shovelling pie into his mouth. He felt particularly hungry after the excitement of the afternoon. 'Wood told me." I'm imaging the most warming, delicious, satisfying steak-and-kidney pie there ever was, sweetened all the more by Harry's Quidditch success. 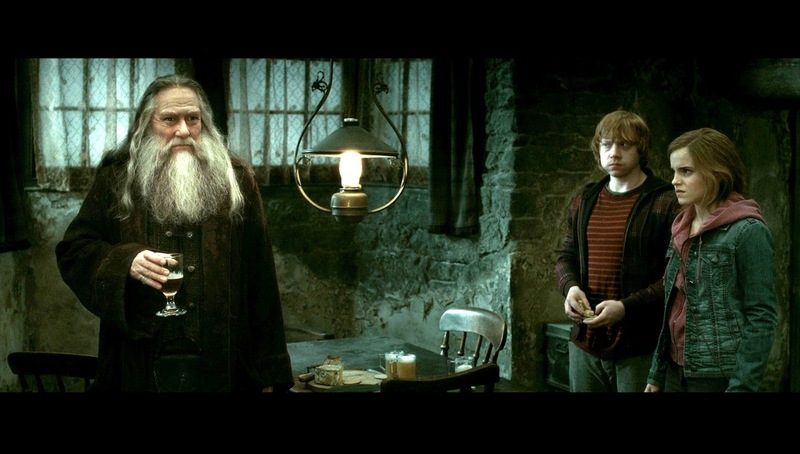 "Harry had never in all his life had such a Christmas dinner. A hundred fat, roast turkeys, mountains of roast and boiled potatoes, platters of fat chipolatas, tureens of buttered peas, silver boats of thick, rich gravy and cranberry sauce- and stacks of wizard crackers every few feet along the table." Another delicious decadent feast. Fat, mountains, fat, buttered, thick, rich. And a happy Harry no longer being abused at Privet Drive. Maybe J.K. wanted to treat Harry as much as possible after writing him that horrible upbringing. "Professor McGonagall raised her wand again and pointed it at Snape's desk. A large plate of sandwiches, two silver goblets and a jug of iced pumpkin juice appeared with a pop. When they had eaten as many sandwiches as they could (the plate kept re-filling itself) they rose and left the office, treading the familiar path to Gryffindor Tower." I like it when simple fun magical things happen in Harry Potter, like a self replenishing sandwich plate, which sounds amazing even if it is in place of the welcome feast. Harry watched, amazed, as a portly ghost approached the table, crouched low and walked through it, his mouth held wide so that it passed through one of the stinking salmon." "Dinner that night was a very enjoyable affair. Tom the innkeeper put three tables together in the parlour and the seven Weasleys, Harry and Hermione ate their way through five delicious courses. 'How're we getting to King's Cross tomorrow Dad?' asked Fred, as they tucked into a sumptuous chocolate pudding." I'm so mad we don't get treated to descriptions of all those five delicious courses, but the sumptuous chocolate pudding sounds delightful. "By seven o'clock, the two tables were groaning under dishes and dishes of Mrs Weasley's excellent cooking, and the nine Weasleys, Harry and Hermione were settling themselves down to eat beneath a clear, deep-blue sky. To somebody who had been living on meals of increasingly stale cake all summer, this was paradise, and at first, Harry listened rather than talked, as he helped himself to chicken-and-ham pie, boiled potatoes and salad." "At last, the fire was ready, and they just started cooking eggs and sausages when Bill, Charlie and Percy came strolling out of the woods towards them. They were halfway through their plates of sausages and eggs when Mr Weasley jumped to his feet, waving and grinning at a man who was striding towads them, 'Aha!' he said. 'The man of the moment! Ludo!'" This must've been an exciting breakfast, sitting among all the exciting sights and sounds of the Quidditch World Cup camp site. "Harry, Sirius and Mundungus looked round and, within a split second, they had dived away from the table. Fred and George had bewitched a large cauldron of stew, an iron flagon of Butterbeer and a heavy wooden breadboard, complete with knife, to hurtle through the air towards them. The stew skidded the length of the table and came to a halt just before the end, leaving a long black burn on the wooden surface; the flagon of Butterbeer fell with a crash, spilling its contents everywhere; the bread knife slipped off the board and landed, point down and quivering ominously, exactly where Sirius's right hand had been seconds before." "He had never been to a wedding before, so he could not judge how wizarding celebrations differed from Muggle ones, though he was pretty sure that the latter would not involve a wedding cake topped with two model phoenixes that took flight when the cake was cut, or bottles of champagne that floated unsupported through the crowd." The rest of the food at the wedding seems to have been sandwiches and tarts, which isn't super exciting but the cake sounds amazing. "Kreacher came bustling to the table with a large tureen in his hands, and ladled out soup into pristine bowls, whistling between his teeth as he did so. He began to spoon soup into his mouth. The quality of Kreacher's cooking had improved dramatically ever since he had been given Regulus's locket: today's French onion was as good as Harry had ever tasted." I'm so glad Kreacher was looking after them all in Grimmauld Place, I bet his French onion soup is delish. "In the meantime, they returned to the basement kitchen, where Kreacher severed them all stew and treacle tart." J.K. sure is keen on those stews, but I reckon they summon up exactly the right warming, magical image, and mmmm treacle tart. "Gloomy and oppressive though the house was, it had been their one safe refuge: even, now that Kreacher was so much happier and friendlier, a kind of home. With a twinge of regret that had nothing to do with food, Harry imagined the house-elf busying himself over the steak and kidney pie that Harry, Ron and Hermione would never eat." This broke my heart a little. When they leave on their mission to the Ministry and Kreacher promises a nice dinner when they get back. I hope Kreacher understands. "They had already spotted Christmas trees twinkling from several sitting-room windows, before there came an evening when Harry resolved to suggest, again, what seemed to him the only unexplored avenue left to them. They had just eaten an unusually good meal: Hermione had been to a supermarket under the Invisibility Cloak (scrupulously dropping the money into an open till as she left) and Harry thought that she might be more persuadable than usual on a stomach full of spaghetti Bolognese and tinned pears." Suggesting a return to Godrick's Hollow definitely calls for a belly full of Spag-Bol first. I'm also glad they manage to keep feeding themselves on their long stint in the tent travelling about the country. "'Oh,' said Ron. 'Yeah... well, I'm hungry!' he added defensively, as his stomach gave an enormous rumble. 'I got food,' said Aberforth, and he sloped out of the room, reappearing moments later with a large loaf of bread, some cheese and a pewter jug of mead, which he set upon a small table in front of the fire. Ravenous, they ate and drank, and for a while there was silence but for the crackle of the fire, the clink of goblets and the sound of chewing." It doesn't seem like much, but this meal follows the break in to Gringotts, a long ride on dragon-back ending in a swim in a loch, and a noisy arrival into Hogsmead. This meal would also be their last before the battle, I think. It sounds simple and satisfying and just the right thing after a long journey. Phew that a long list! But I wanted to include lots of mentions of food, because they all have their own little important places in the story. I hope you enjoyed! Did I miss any good ones? Let me know in the comments! I'm a Nutrition student from Brazil and I'm working on a university project about Harry Potter's food!